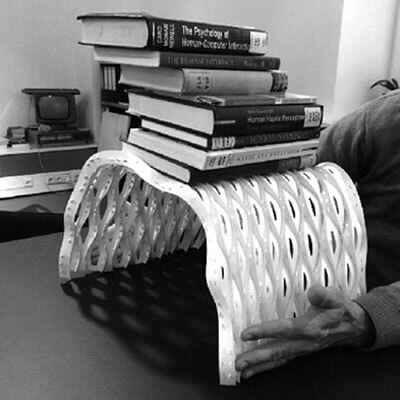 The motivation for this research study was to develop a material-orineted extreme light-weight bending-active construction system, with as thin as possible plywood boards (2-3 mm) using numerical form-finding methods and cnc milling. System-based models enable to design constructions for high complexity and extend the sample space of architectural design. Algorithms herewith help to optimize the construction in a numeric form finding process, considering ergonomic and material specific target functions. Wood material has typically low stiffness. Its high elasticity, mostly a disadvantage in terms of load-bearing can be used to realize highly efficient material specific building structures. The „social structural system behavior“ developed through the soft interlocking connection, plays a crucial role. Digital fabrication processes enable material manufacgturing that’s both precise and efficient. Form adaptive construction element integrated connection details allow an easy assembling without the need for glue or screws. The characteristic wave-shaped structure creates a high load transmission construction that allows the reduction of material to extremely thin veneer birch plywood. The integration of design computation, simulation and digital fabrication leads thus to a novel and expressive architectural structure that builds new connections between architecture, engineering, and art. The developed construction system can be applied onto complex geometries that are optimized for load-bearing. This enables a construction with an outstanding ratio of weight to load-bearing capacity. First physical performance tests illustrated that the wave-shaped construction elements transfer the forces so well, that even a paper model with an own weight of only 120g can bear 6kg, over a span width of 40cm, without any difficulty. This means a ratio of own weight to load-bearing of 1/50.